The Lady of the Winds. Poul Anderson. In Analog October 2001 Anderson produced a Larry Niven kzin story, and here he provides/ed a fantasy tale of a bard by the name of Cappen Varra, whereof those of you whose reading perchance covers the landscape of the mind beknown as ‘fantasy’ may be familiar through the ‘Thieves World’ books edited by Robert Asprin and Lynn Abbey. I only know this from the editorial introduction, as I tend to avoid fantasy like the plague. The bard, harp in hand, is introduc-ed struggling through a range most mountainous, a dreadful storm in his face. Whereupon and verily he is met by a lady of an ethereal nature, whom he must persuade to bestow upon him and his colleagues the gift of continuing their journey through the treacherous winter pass. Give me my due, I did manange to turn the pages – or rather, click the thumb-wheel for the next screen, and this wasn’t easy as the bumper size of the issue was constipating my Cassiopeia. The story seemed fairly bog-standard, but I should suggest you hie thee away to pastures elsewhere (such as www.tangentonline.com) if you want to find a review written by someone who likes fantasy tales. The editorial intro to the next story left me unenthus-ed. This fantasy tale features on Kedigern, a clever but murmudgeonly wizard, who evidently co-habits with a Princess called Princess and a dog called Spot, and about whom previous tales have been wrought. The tale hinges upon Prince Bondo, stricken at birth with a visage of gross unpleasantness by a piqued fairy. And by cunning and magicke the wizard sorts him out. Ahh, more like it, I think to myself upon starting this story. A golf club professional finds one of the club members remorselessly driving ball after ball. Foray visits the wife of the obviously perturbed golfer, and a strange Bradbury-esque ending ensues. But only Bradbury-esque, as the story doesn’t really give much more than a taste of Bradbury – a pale imitation, almost. The Cat’s Pajamas. James Morrow. After a quick, impulse wedding, Vickie and Blake happen upon Pollifex Farm, and live to regret it. Blake quickly ends up with his brain floating in a vat which is on a library trolley, in a nightmare experimental laboratory where human/animal mutations are being created. QZ-11-4, an integrity gene, is the prize which Dr Pollifex seeks. And he succeeds – but how will the local population react to the strange mutants with impeccable integrity? Will the local villagers turn to flaming torches, or elect them? A strange read, as the tale is told with humourous description throughout, but a bit like the characters, doesn’t quite fit together too well. In Glory Like Their Star. Gene Wolfe. Told from the perspective of ‘aliens’ on a planet were the ‘primitive’ community struggle with the advanced civilisation and its practices. The narrator describes his struggle to survive after crashing in the desert (passing reference to a subspecies without tails referring to the planet as Earth). The narrator survives due to the help from one of the native race, but both he and the community at large struggle to conceptually grasp the gulf between the races. The narration flows silkily without their being much substance, leaving you very much wanting more than this morsel which melts quickly in the mouth. One of Her Paths. Ian Watson. The question of whether we are alone, individually, and as a race, and the nature of time and reality and perception are explored (much better than Steele story in which duty rosters and Minutes of Meeting are provided!) And the story being written in the present tense falls into place, giving the story a sense of actually happening now. Graphic novelist Gaiman gives a very graphic, but short, take on the nature of Hell and punishment, with a twist in the forked tale that isn’t really surprising. Nicely done, but doesn’t add overmuch to this story group. 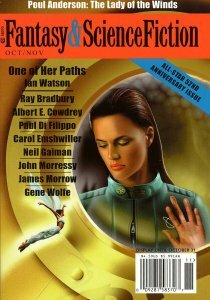 The story is presented as a follow-up to ‘Foster Mother’ in F&SF Feb 2002, a dark, brooding and strange tale of a goatboy. This story is slightly more straightforward – a possibly post-holocaust scenario in which a main living alone in the mountains finds/is found by an enhanced, intelligent lizard/dino. Part of the ongoing battle, the creature is wounded and in need of help. The pair are both in need and find in each other, against the odds, something, however small, to counteract that which is going on around them. Queen for a Day. Albert E. Cowdrey. Very much in the vein of King of New Orleans (F&SF Feb 02). Homicide cops are on the trail of a garroter. Or are they? A young man finds himself talking to a stranger on a train. The book the stranger thrusts upon him has a compelling influence on him, and for the rest of the life. Nicely done, but genre readers will not be surprised along the way to any great extent. Morrow, Wolfe, Emshwiller, and Cowdrey all entertain. Watson was the pick of the bunch for me. The remaining stories don’t do much for me.